Continuous shearing by biaxial rotary blade for primary crushing and coarse crushing. 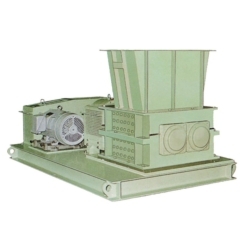 Low pollution design makes unnecessary measures for vibration reduction, soundproofing, dust-collection. The best choice for preparatory crushing of large size materials. Copyright(C)2018-2003 福岡九州の粉粒体機器メーカー ヤマト機販 All Rights Reserved.